The pain and discomfort caused by carpal tunnel syndrome can make completing basic everyday tasks difficult. Many carpal tunnel sufferers find relief by wearing a wrist brace, which is designed to immobilize the wrist and keep it in a neutral position while it heals. Choosing the best wrist brace for your needs can be difficult if you don’t know what to look for, so we’ve put together this handy guide to the top wrist braces sold in stores and online. But first, we’ll look at what causes carpal tunnel syndrome and how wrist braces aid in pain reduction and healing, as well as covering the top 5 carpal tunnel braces available. 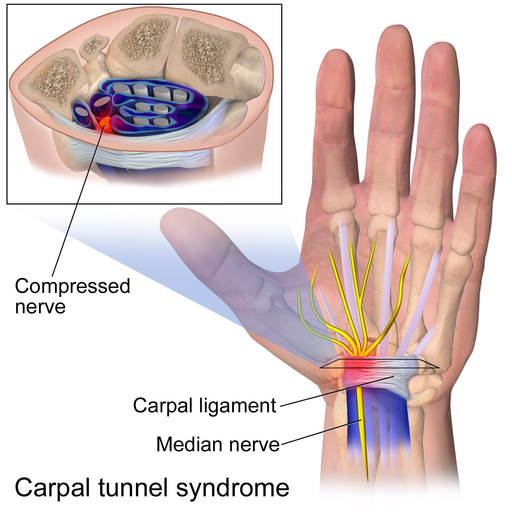 Carpal tunnel syndrome occurs when too much pressure is placed on the median nerve, which runs through your wrist and passes through the carpal tunnel (the narrow hollow between the bones and ligaments of the wrist). Common symptoms of carpal tunnel syndrome are burning and tingling sensations, tenderness of the wrist, and numbness of the palm and fingers. While not life-threatening, carpal tunnel syndrome can cause a great deal of discomfort that impedes everyday activities requiring use of the hands. If left untreated, carpal tunnel syndrome symptoms can worsen and lead to loss of feeling in the fingers, loss of grip strength, loss of coordination, and muscle wasting. There is no single cause of carpal tunnel syndrome. Carpal tunnel syndrome can be caused by several factors and medical conditions, including high blood pressure, diabetes, fluid retention, obesity, pregnancy, rheumatoid arthritis, and thyroid disease. Carpal tunnel syndrome can also occur as a result of repetitive motions like typing. Diagnosis of carpal tunnel syndrome is confirmed by nerve conduction velocity testing (shown in the video below), which involves measuring the speed at which an electrical impulse runs along the median nerve. Common treatments for carpal tunnel syndrome are analgesia, corticosteroid injection, splinting, and (in severe cases) surgery. Successful treatment usually eliminates pain and tingling and restores function to the wrist and hand. How Can a Carpal Tunnel Syndrome Brace Help? Wrist braces offer a non-surgical option for treating carpal tunnel syndrome. They are designed to keep the wrist in a neutral position, thereby alleviating the compression of the median nerve. Wearing a wrist brace while carrying out your usual daily activities can help relieve pain, speed healing, and prevent re-injury. Wrist braces are also ideal for keeping the wrist in a neutral position while you sleep. According to a 2012 Cochrane review, wearing a wrist brace at night is more effective at alleviating carpal tunnel symptoms than using no treatment at all. Carpal tunnel wrist braces can be purchased in most drug stores, department stores, and sporting goods stores. There are three main types of wrist braces: standard support braces, post-operative wrist braces, and sport wrist braces. Standard support brace: This type of brace is used to rehabilitate the hand and restore function to the wrist in individuals with severe wrist injuries or chronic inflammation. A variant of the standard support brace is the repetitive strain injuries (RSI) brace which helps prevent wrist pain and injury caused by overuse of the hands. Post-operative wrist brace: This type of brace is designed to support the wrist following surgery for carpal tunnel syndrome, wrist fractures, and other injuries. Post-operative braces tend to be bulkier and more rigid than other types of wrist braces. Sport wrist brace: Sport wrist braces are specially designed for those who play sports that require significant use of the hands and wrists – such as basketball, cricket and tennis. Not only do sport wrist braces protect the wrist and prevent injury, but they also reduce wrist pain and speed recovery in individuals who have already suffered an injury. Below are a few features to look out for when buying a wrist support to help reduce carpal tunnel pain. Wrist braces usually have several straps that can be adjusted to help the brace fit more snugly around the wrist. When buying a wrist brace, it’s a good idea to look for one that can be easily adjusted with one hand. The overall comfort of a wrist brace is largely determined by the materials it’s made from. Look for braces made from breathable materials that wick away moisture and help prevent odour. A brace with ventilation holes will provide extra air flow and ensure your hands stay dry, cool, and comfortable. Some braces have extra padding that adds to the wearer’s comfort and provides extra support for the wrist. Too much padding can restrict movement and reduce flexibility in the wrist, however, so it’s important to consider how you plan to use the brace. If you plan to wear the brace for extended periods during the day, it’s best to choose a brace with less padding. When it comes to choosing a wrist brace, the old adage is true: you get what you pay for. Generally speaking, higher quality wrist braces cost more than less effective ones. When buying a wrist brace, consider your individual needs and budget. A less supportive wrist brace may be fine if you’re only experiencing mild wrist pain. Now that we’ve gone over what carpal tunnel wrist braces are and how they aid in the reduction of pain and swelling, we’ll take a look at the top braces available on the market today. Here are our picks for the best wrist supports. The BraceUP Wrist Support Brace with Splints features two splints (one on the palm and one on the back of the hand) that provides rigid support for the wrist. It is made of a breathable neoprene material and lined with an antimicrobial inner fabric that prevents the growth of odour-causing bacteria. Extra cushioning on the palm adds to the wearer’s comfort, while moisture-wicking technology keeps hands dry and cool. This brace provides heavy-duty support for carpal tunnel syndrome, arthritis, and other severe wrist injuries. Since it provides rigid support, however, it is not ideal for use while engaging in everyday activities that require bending of the wrist. 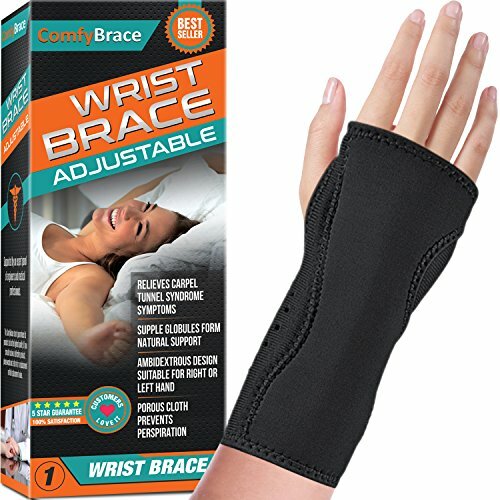 The Comfy Brace Night Wrist Sleep Support Brace is a super-soft wrist support that is lined with cushioning beads to soothe and support the wrist as you sleep. It is very easy to slip on and off and can be worn on either hand, making this brace an economical option for those experiencing pain in both wrists. The brace is also adjustable, ensuring a snug fit even on smaller wrists. If you’re looking for a brace that will gently support the wrist while helping to relieve mild aches, the Comfy Brace Night Wrist Support Brace is an excellent choice. It is not ideal, however, for those with severe injuries that require complete immobilization of the wrist. 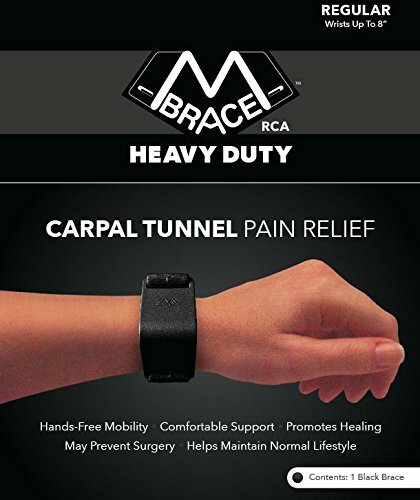 The M BRACE RCA Heavy Duty Carpal Tunnel Treatment Wrist Support is one of the most innovative wrist braces on the market. Developed and patented by physicians, the brace features a unique watch-style design that snaps around the wrist to provide support for the carpal tunnel without compressing the median nerve. When worn consistently, the M BRACE RCA helps minimize carpal tunnel syndrome pain and may even eliminate the need for surgical treatment. The brace is available in two colours (beige and black) and comes with foam insert pads for those who require extra cushioning and/or have sensitive skin. What we love most about the M BRACE RCA Heavy Duty Carpal Tunnel Wrist Support is its sleek, streamlined design, which makes the brace appear more as a stylish accessory than a therapeutic device. It is very lightweight and comfortable enough to wear all day and night. The shape of the brace ensures it wraps snugly around the wrist to minimize pain and help heal inflammation. The M BRACE RCA is only available in one size, however, and may be too large for people with small wrists. 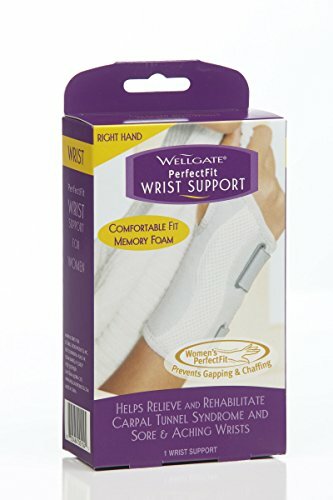 The Wellgate PerfectFit Wrist Support is the only brace on our list that is designed specifically to conform to the natural contours of women’s wrists. It features a slim-fit design and moisture-wicking technology to keep your hand cool, dry and comfortable all day (or all night) long. Soothing memory foam and uber-soft fabrics add to the wearer’s comfort, while the streamlined design of the brace allows it to be easily worn under women’s clothing. The PerfectFit Wrist Support is recommended for women experiencing mild wrist pain from arthritis, carpal tunnel syndrome, sprains, strains, and tendonitis. One of the main benefits of the PerfectFit Wrist Support is its flexible, fully adjustable design, which allows the wearer to either bend the wrist or keep it in a neutral position as needed. This makes the PerfectFit ideal for use while sleeping, typing, and carrying out everyday tasks. The Wellgate for Women PerfectFit Wrist Support comes in only one size, but it can be adjusted to fit almost any wrist. One thing to keep in mind when considering this brace, however, is that it is designed for use on only one hand (left or right). The Fitted Wrist Brace by Mueller is one of the most popular wrist braces currently on the market. 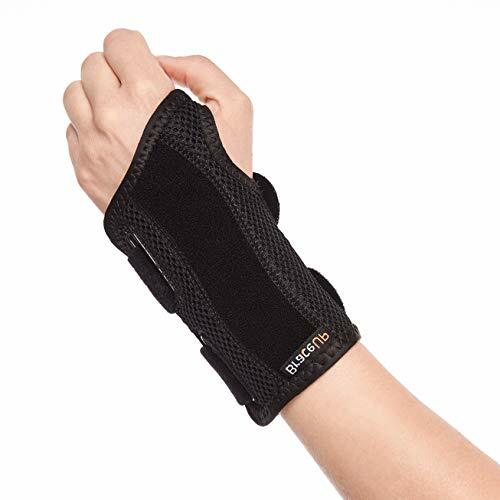 Featuring a lightweight, flexible construction and moisture-wicking fabric, this brace provides excellent wrist support while still allowing a full range of motion of the fingers and thumb. Extra padding along the wrist adds comfort without bulk, while moisture-wicking technology keeps your hand cool, dry, and odour-free. When worn consistently, the Fitted Wrist Brace by Mueller can help reduce the pain and inflammation associated with carpal tunnel syndrome as well as improve wrist mobility. One downside of the Fitted Wrist Brace by Mueller is that it can’t be adjusted for use on either hand. The brace comes in only one configuration (left hand or right hand), so you’ll need to purchase two braces if you require support for both of your wrists. Another frequent complaint among users is that the thumb hole is too small. 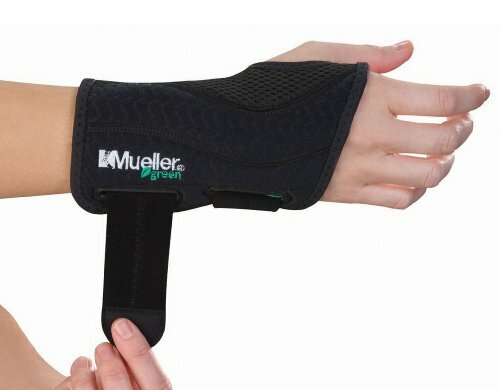 Despite these minor drawbacks, however, Mueller’s Fitted Wrist Brace is a great option for anyone seeking relief from various types of wrist pain, including carpal tunnel. Choosing the right carpal tunnel syndrome brace from the hundreds that are on the market can seem like trying to find the proverbial needle in a haystack. Armed with the above information, however, you should feel more confident about selecting the best brace for your needs and budget. While there is no one brace that is perfect for everyone, the five wrist supports we’ve reviewed in this article should give you an idea of the different wrist support types, features, and degrees of support that are available.